Planning to go fly fishing for redfish in Texas? Well, you might want to listen to our show with Rick Hartman as he discusses easy ways to catch this spooky fish. Rick has been fly fishing for redfish for over 23 years and guiding full time for the last 10 years. He is an incredible fly caster. He puts his skills to good use since he specializes in sight fishing for redfish, speckled trout and snook in the flats of southeast Texas. Rick takes pride in knowing the waters in southeast Texas like the back of his hand since he puts in 175 to 210 days every year guiding anglers to trophy redfish here. Rick has been a part of several television shows such as the Scott Martin Challenge. 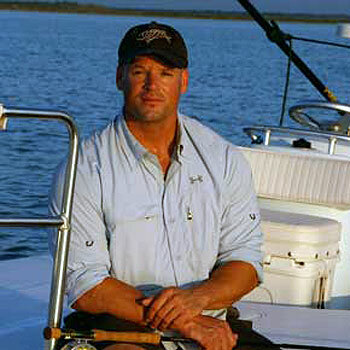 He has also won many competitions for casting and fly fishing including International Best of the West, Field and Stream Total Outdoorsman Challenge, ESPN Great Outdoor Games Show, Fly-Fishing Masters, and a lot more. According to Rick, “A lot of the Texas coast is very well protected from the Gulf of Mexico and we find redfish among other species all up and down Texas.” This goes all the way around up to the Northeast United States. Most of the landmarks and islands in Texas are man-made. "When they dredged the international coastal water way, they had to put the dredge or spoil somewhere. They dumped it up along the inter-coastal waterway and that made a lot of our landmarks early in the days." The Texas area is one of the best areas especially for flats fishing. The bay is roughly six miles wide and 60 miles long of crystal clear waters that average two feet deep. Much of it is also just pure white sand over on the east side. They have a lot of interconnecting canals and deep-water areas connecting small flats. What makes the area unique is that they don’t have any deep water connecting any of the flats other than the inter-coastal waterways. This means that even if the tide is falling out, you can still fish on the flat the whole day; unlike when you’re fishing in deeper areas where the water totally goes off as soon as the water starts falling out. "It’s phenomenal. It’s a neat area." There are positives and negatives to each time of the year. For the summer time, the whole summer offers just extraordinary fishing. However, it typically gets very hot. Too much heat will get the fish horribly lethargic and they will not be very receptive to eating anything you throw at them. During the fall, the weather is wonderful. You don’t have a lot of wind and the fishing is very predictable. However, in the late spring, around mid-November to late November, you will start running into weathered patterns with the wind howling out the north and south. During this time, there will be two or three beautiful days where fishing opportunities are fantastic. "You’re going to have to pick which one you think suits you more." Redfish don’t spawn in the Texas bay since it is very shallow. But you can get large fish in it almost any time of the year. Still, it is very difficult to find a 40-inch redfish in eight inches of water. What they consider a really big red ranges from 33 to 24 inches. However, when the fish are spawning, big bull redfish will be sitting around the jetties, at the Santiago Pass down at South Padre until Port Mansfield. This usually happens around mid-August to mid-October. During very, very late spring all the way through the summer and early fall, you’ll be able to target other species in the Texas Bay other than redfish. This includes snook, sheephead or the so-called Texas permit, the black drum which is a cousin of the redfish, the lady fish or ‘slang’, pompano, and tarpon. Near the shore, you there are opportunities for king mackerel, Spanish mackerel, large Jack Crevalle, and the so-called ‘bonita’. They also have what is called the Texas grand slam, which consists of a redfish, trout, and flounder. They also have the Texas super slam or the grand slam wherein you just add a snook into the list. When it comes to fly reels for redfish, Rick has a few recommendations: First, you will need to buy a high quality reel so that you are not going have to buy a new reel every two years. Second, you should get one with a large arbor because you can retrieve line faster. Another thing is to choose a reel that does not corrode, that is anodized and stamped. Make sure that you have a real that is going to hold up in the salt. Stealth is very important when fishing for redfish. Sometimes the fish are ‘dumb’, in other areas, the fish could be extremely wary. So line slap can always be an issue. The shallower the water, the more stealth becomes an issue – redfish are just as spooky as most bonefish in a foot of water. So if you’re going to drop your line, it will make more commotion when it hits the water. However, you can buy lines that have longer front tapers and come to a fine diameter so that when it hits the water, it’s not as noisy. Lines are designed to turn over bigger flies. This means that those lines are going to be thicker in the front taper and they’re going to make more noise. Lines that are designed to turn over smaller flies are going to be smaller in the front taper or smaller diameter and a little bit longer and they will make less noise. According to Rick, in Texas, redfish generally are not going to be at any vegetation or any structure – rather, they will be seen where there is bait. "If the tide has brought in a bunch of bait in the area, then the fish are going to be there. That’s why we see more redfish over on our west side." When it is a bit colder and the tide is out, you might find fish around points with vegetation. In conclusion, if you’re planning to go fly fishing for redfish, always start looking at areas with more vegetation and those that are holding more baitfish. "It really comes down to where the water pushes or the wind pushes the bait because if there’s no bait in the area, then quite often, there’s no reason for the fish to be there." Listen to our full interview with Rick Hartman and learn tips and ideas on how to have a productive day fly fishing redfish in Texas.